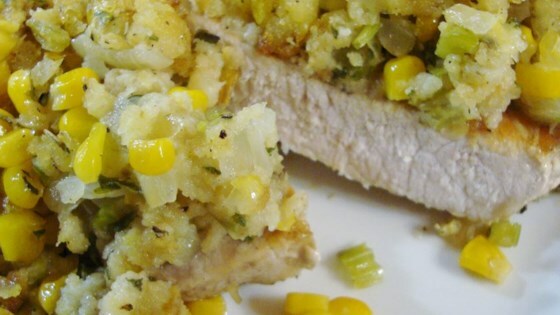 "This is a family favorite that we often had when company came for dinner. This recipe has gone home with many invited dinner guests. Mom never follows a recipe when she cooks, so this is my best guess of how she makes them! You may have to tweak things a bit, as all values for ingredients she uses are approximate. I still have not been able to replicate hers exactly!" Heat olive oil in a large skillet over medium high heat. Brown chops, turning once, and transfer to a shallow baking dish. Add water, and cover. When chops are almost done, melt butter in a medium saucepan over medium heat. Cook and stir celery and onions until onions are translucent. Stir in bread crumbs, corn, poultry seasoning, salt, and pepper. Cook for 5 minutes, then spoon stuffing over chops and return to the oven. Bake, uncovered, for 15 minutes more, or until no longer pink in the center. Good, except for the cream corn. The sweetness just seemed not to belong in this savory dish. Maybe I'll use whole kernal corn next time. Other than that, it was very tasty and very easy! This was very tasty and easy to make. I omitted water and stuffed pork chops right after browning then topped with cream of mushroom soup and baked 1 1/2 hr. Very delicious. Served with mashed potatoes and gravy (made with the juices of the pork chops and water), and green beans. Very good. My family liked it. I will make it again. I used at least 1/2 cup of onion and celery.I used about 3 1/4 cups of bread crumbs. I also put about 1/4 cup of cream of mushroom soup.